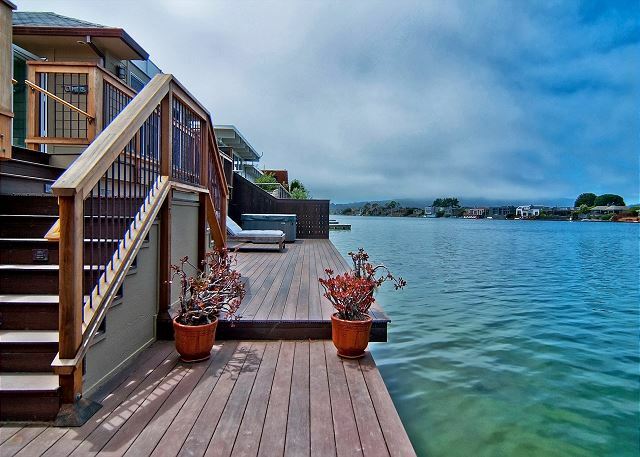 Situated on the wide part of the Seadrift lagoon this new construction home features an open floor plan with expansive views of the water throughout. 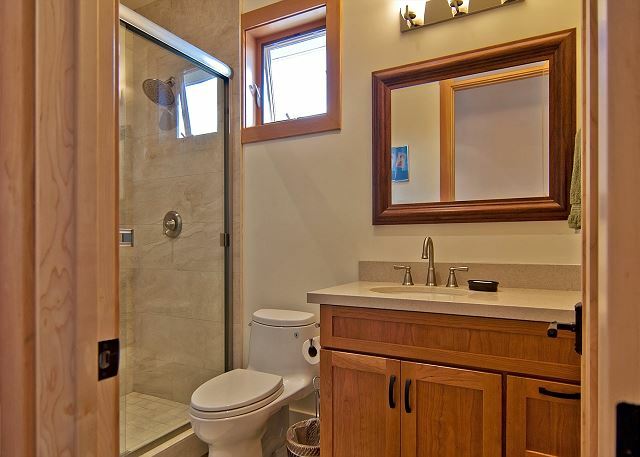 With three bedrooms and three full baths this home can accommodate up to eight people. 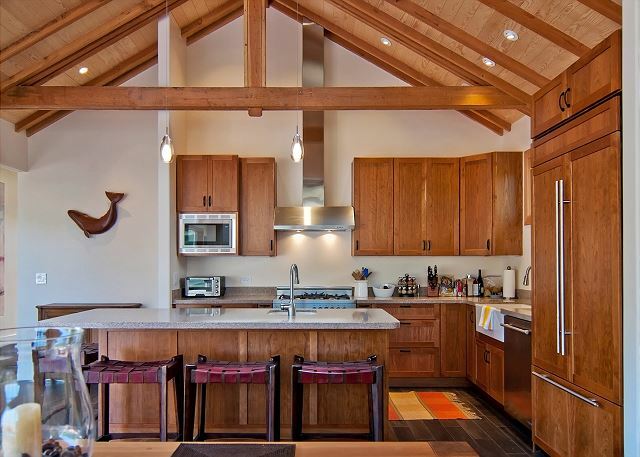 Well equipped kitchen with granite counters, gas stove, and dishwasher. 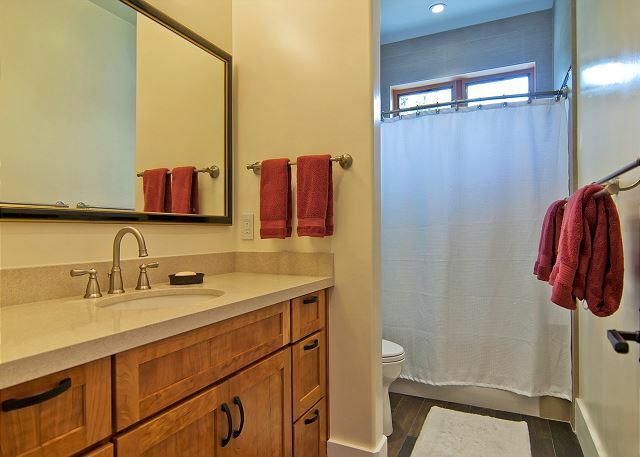 Home also features a gas fireplace, gas BBQ, hot tub, and two paddle boards plus a kayak so that you can enjoy all that the lagoon has to offer. Pet Friendly. It’s a beautiful home, we’ll definitely do that again. Everyone at oceanic realty was very helpful. Loved the house. Loved the layout. Really felt like we were staying in someones house, not a rental. Having the Hot Water go in and out of service for the last three days was quite disappointing. Management company was extremely responsive, but it seems like this might of been an issue that the owners should have dealt with already. Beautiful home....great open layout and a fantastic patio! We had a wonderful stay in this beautiful home full of light. Overall, great rental experience! Beautiful house and very helpful rental agency. We had a great time with house that is perfect for children and grandchildren. The weather was remarkable and the house is always clean and hospitable. Rental of wet suits made the ocean play much more fun. Can't wait to return next year. This is a very well equipped beach house. Great kitchen and deck. We will be back - next time for a week! 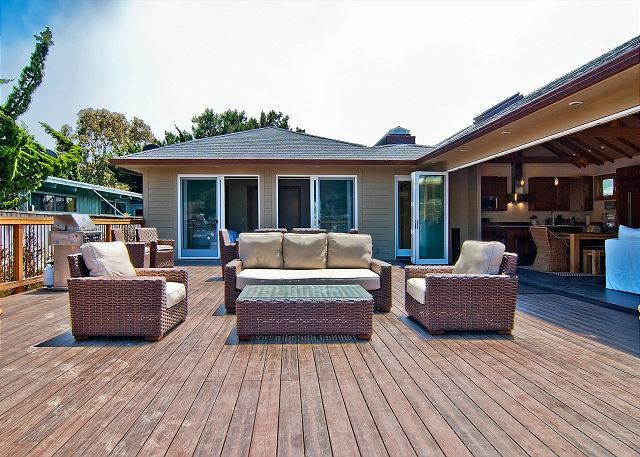 Very clea/n and inviting with a wonderful view and a large deck for enjoying being outside. What an awesome house with amazing views! The home feels like it was just built, everything is updated. We will return. 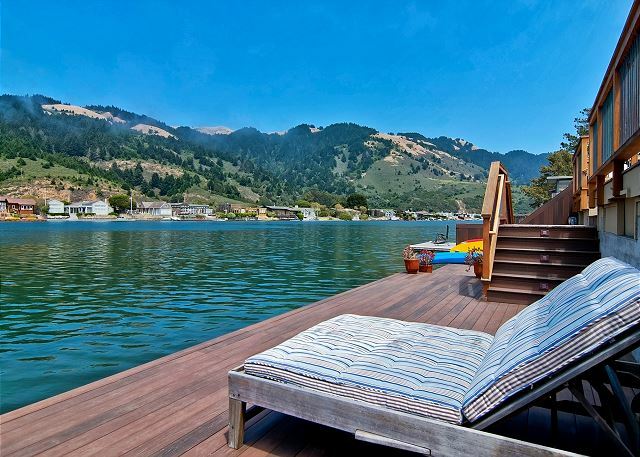 Lynne M from Palo Alto, California does not recommend this vacation rental. 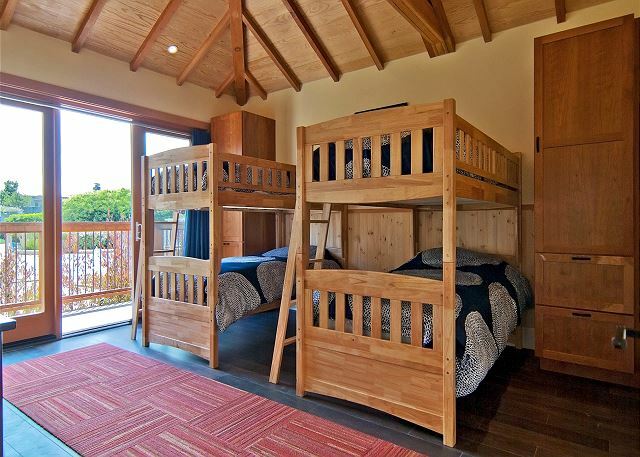 This house is worth the top dollars you will spend if you have kids that could sleep in the bunk beds. Also, they allow pets. I found the house uncomfortable. There is only one bed (king) that was up to our standards. It took a computer genius to figure out the ridiculous tv in the living room. No instructions left. There is one couch in living room that seats three people so you can't watch a movie with a group. The curtains in bedrooms are nearly impossible to open and close. We gave up and left them shut. All of this said, I think you will be fine with the house if you are not so picky and you need to rent a house that allows pet. Absolutely wonderful house, we really enjoyed it. Wanted to let you know the handle of the oven came off the first time we tried to open it. Also the septic alarm went off on Thursday night which we reported that night. Thanks again! 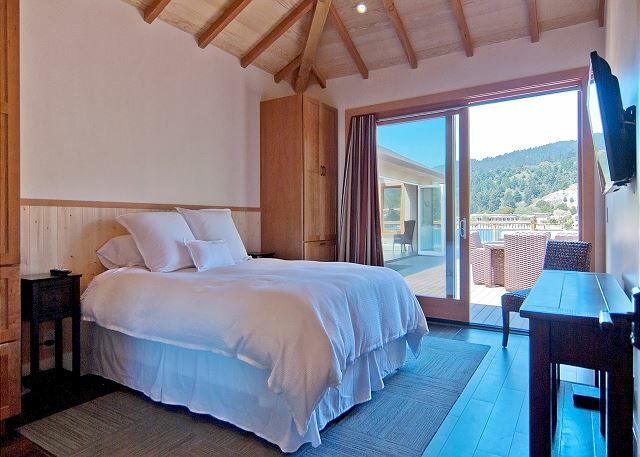 We used it for a family stay during a family wedding weekend at another venue in Stinson Beach. Our family has been going to Stinson for 50+ years, staying on the beach, and this was a really nice change of pace and exposure. 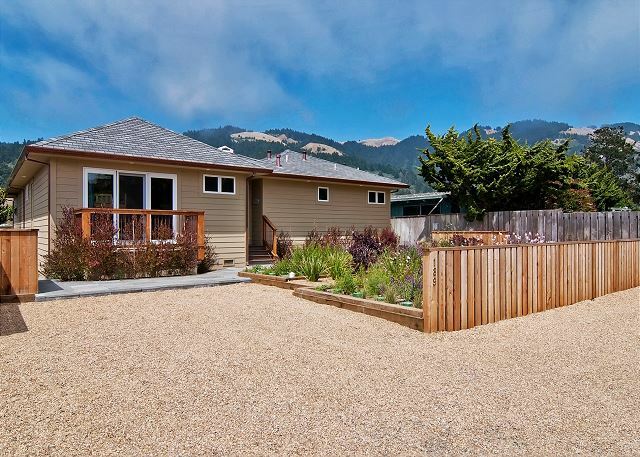 As a Stinson Beach local who grew up in Seadrift and who finds a way to return 2-3 times per year to the beach, I have seen and rented many houses. This house is great. It's been remodeled perfectly and has a great indoor outdoor feel. The hottub on the water is great and makes the house lovely in all weather. Great house, great layout, great service with Oceanic. We will be back! I've stayed in this beautiful home twice and have only superlatives to say about it. Impeccably maintained, ideally situated, with a sprawling, comfortable common area that flows naturally to the outdoor space, this home is great for getting family and friends together. Fantastic house in an amazing place. Loved opening the wall of doors to the open air. Great having the paddleboards and kayak. Would definitely stay here again. 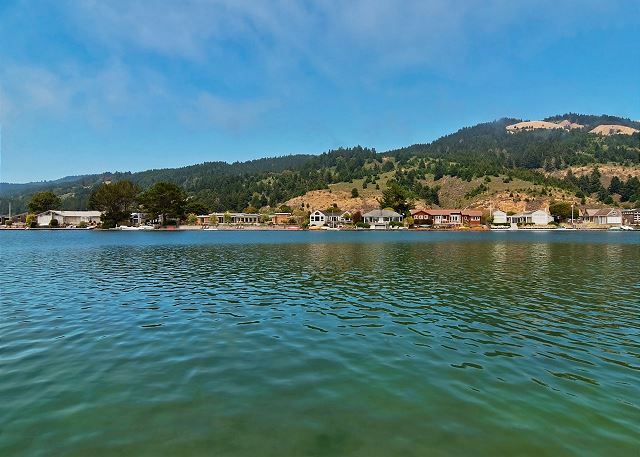 We love Stinson Beach! Thanks Oceanic! 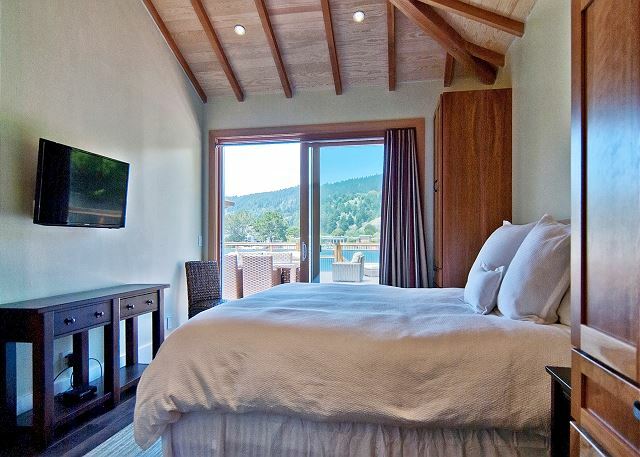 Oceanic Realty made our stay in Stinson Beach perfect! They went above and beyond to make sure our house was comfortable and well provisioned and even came over to make a couple adjustments for us. We could not have been happier! We had a fantastic week at 189 Seadrift. 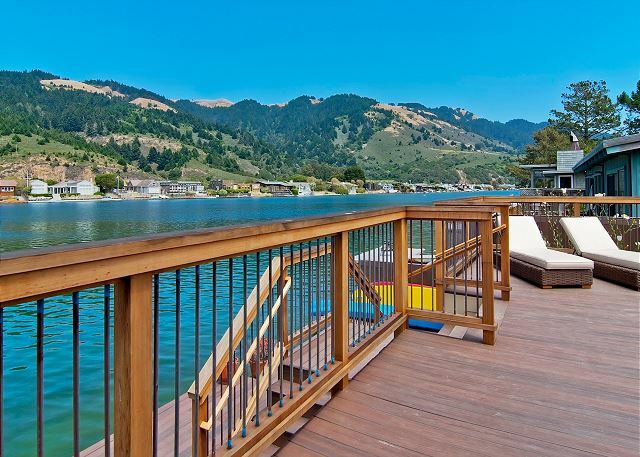 Beautiful house with many amenities - modern, open kitchen, spacious deck with lovely deck furniture, water toys (kayak and paddle boards), 3 bathrooms. 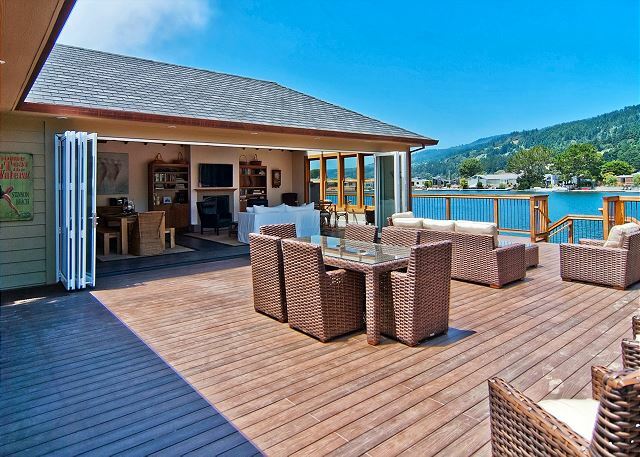 Beautiful home on Stinson lagoon. We'd stayed in this house a year before and it was wonderful from top to bottom. this year, it seemed to show a little more wear and tear. The rugs in the kitchen were dirty, the glass on the outside tables hadn't been cleaned, we had to wait 1/2 hour before we could get in and there were three paddle boards, but only 1 paddle. The house overall is wonderful and the office was responsive to our few complaints, but we were a little disappointed following our first experience. Finally, I think that the TV in the main room should have an instruction sheet since we weren't familiar with the system. 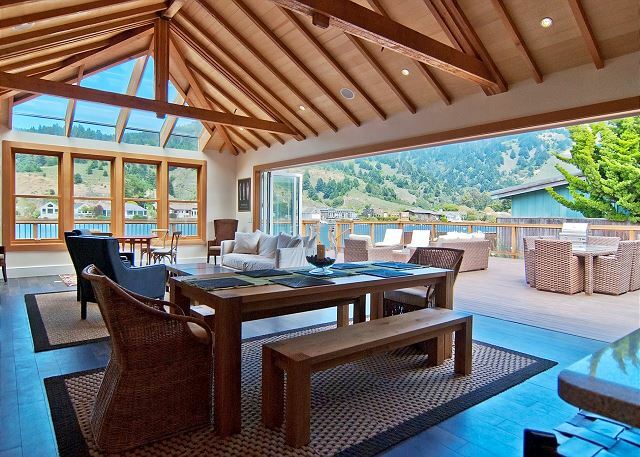 What a perfect house to relax in and enjoy! Location was ideal (very close to beach) and having our own water outlet to kayak and paddle board in made it that much more special! 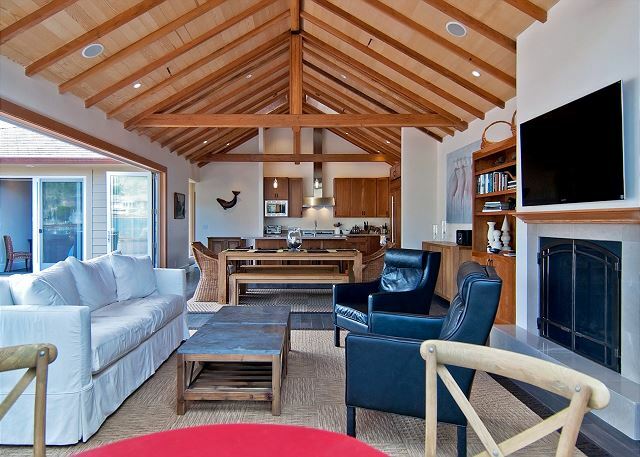 The house was spacious, very well designed and perfect for enjoying time with family and friends. Gathered my family here for a long weekend. Excellent !!! Very accurate description of property. Very spacious accomodations. Use of TV/DVD instructions very inadequate. Stayed over Christmas with my children and grandchildren. Even though it was cold, we were able to do walks on the beach and use the kayak and paddle boards. Close enough to San Francisco to do day trips, Exploratorium, and the pier. Wished that it would have been nice enough to open up the doors. Maybe next time. We really enjoyed 189 Seadrift. It was great to arrive and find four bikes we could use plus stand-up paddle boards and a kayak. The rooms were comfortable. The house is lovely. We had one small WiFi issue, but the management company did a great job addressing the issue. Highly recommended! We enjoyed our stay thoroughly. We owned a house in Seadrift for several years and we've rented lots of different houses there. 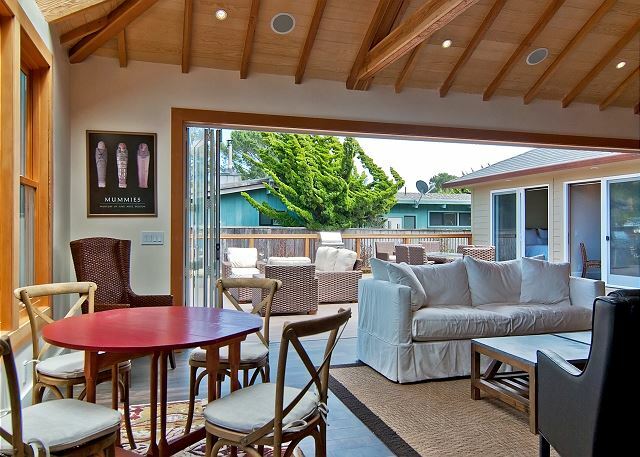 189 Seadrift is the nicest, newest, best-appointed rental house we've seen. 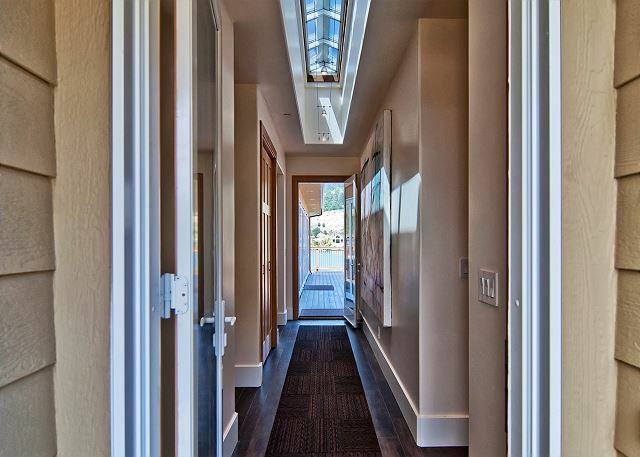 It's plain on the outside, but beautifully designed and appointed inside, with huge windows and easy access to the large deck, which make for great indoor/outdoor living. The location on the wide part of the lagoon is perfect, and the stand-up paddleboards are a nice extra. Finaly, the owners' willingness to accept pets is a huge plus, since few other rentals permit pets. We had a relaxing time in this beautiful well appointed home. The setting was stunning and the lagoon provided endless hours of fun for the kids. Apologies for the delay - jet lag! 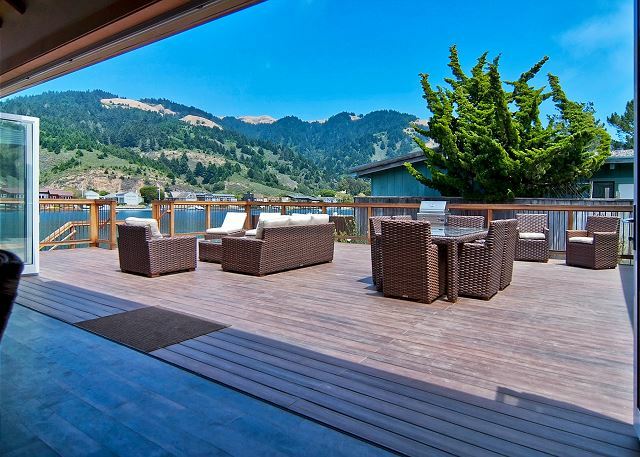 We have rented before at Stinson on 3 occasions. This was the best by some margin. We had a terrific stay in this property. 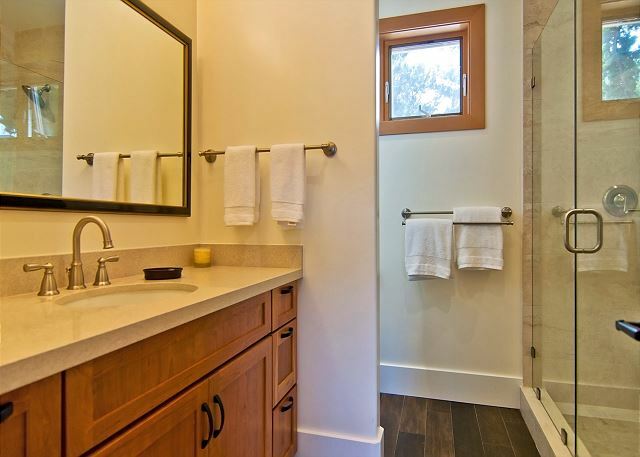 Absolutely as described, clean, well equipped (very) and cannot be faulted. We enjoyed the beach and had it almost to ourselves most days and of course the lagoon. our rental was fantastic, beautiful views of the lagoon and hills and great indoor/outdoor space. 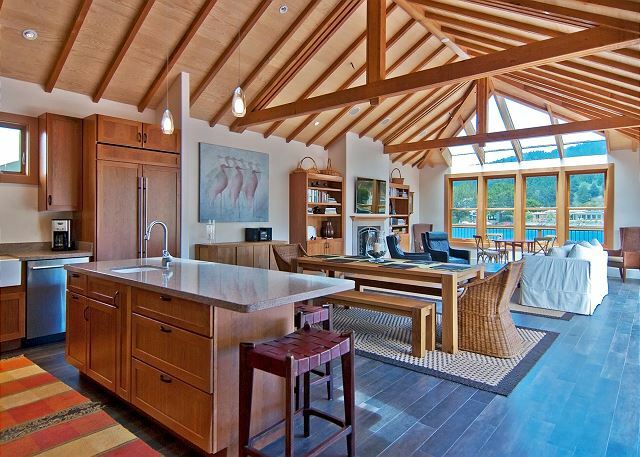 Great vacation home for family get-together -- with dogs! Spacious, informally (but comfortably) furnished indoors and outdoors. 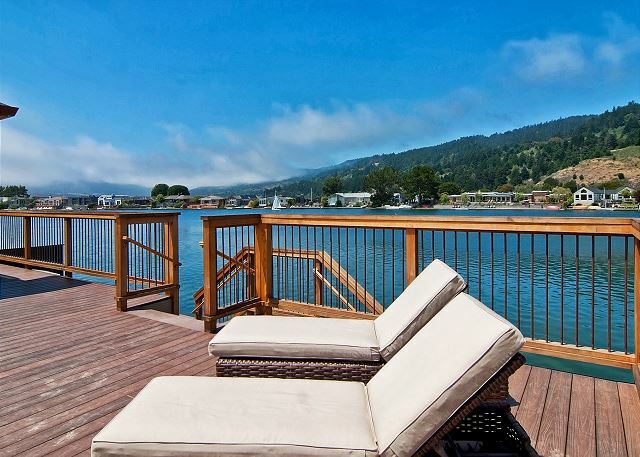 Lots of extra goodies -- 2 stand-up paddle boards, 2 person kayak, 4 bikes, hot tub on deck. Enjoyed the lagoon and the beach. Ate all meals in; shared cooking. This was our first time renting a property for vacation and the experience was more than we could expect. The beds are very confortable and everything was really clean. We use the kayak, bikes and hot tub and had a marvelous time. The only thing that I can recommend to the management company is to let some extra paper towels (what it was in the kitchen was not enough) and more toilet paper ( even if there was one extra in each bath and we didn't use it all, it make you nervous when you another one without open :) ) I also recommend to the future guest to bring or buy some groceries in Mill Valley or San Francisco before you get to Stinson Beach. There is only one small market in town and VERY expensive. Only one place to have a mediocre dinner and also VERY expensive, but overall it was an incredible experience. I will go back in a heart beat! 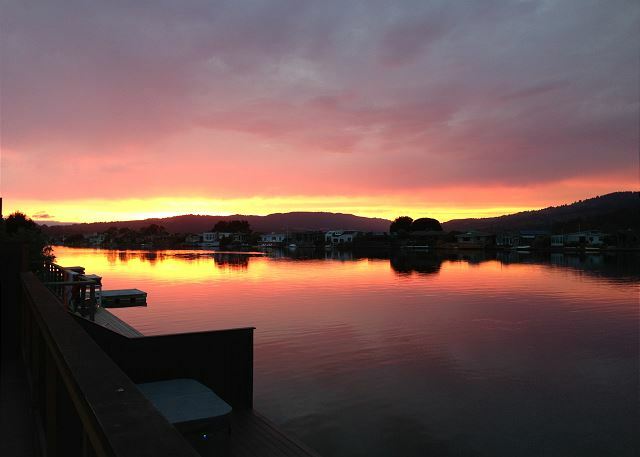 Another fabulous vacation in one of my favourite houses on Seadrift Lagoon side.